Ask Leo! 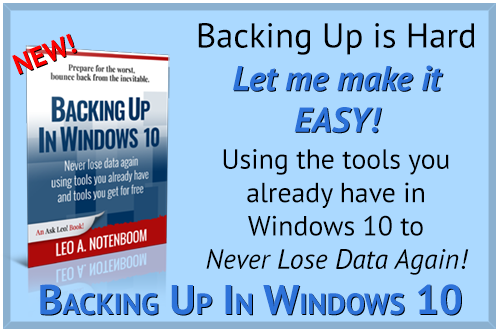 #694 – Why is Windows 10 Telling Me “There Is a Problem with Your Microsoft Account”? Why is Windows 10 Telling Me "There Is a Problem with Your Microsoft Account"? "Problem with your Microsoft Account"? Probably not. And there's a simple fix. Also: Stuck printer queues, and email in seconds, hours, or days. Completely off topic: another, different peek into my weekend (scroll down for description). Whenever I get to my Windows desktop screen I always get this message in my notifications area that says there is a problem with your Microsoft account — most likely your password was changed. I haven't changed it any time recently and when I log in to my Microsoft account, it never shows me there is any problem. This is every time I get to the Windows desktop. What is going on with this? Is this a bug on their part? I don't really use my local account on my computer. This was a head-scratcher for me when I first encountered it some time ago. The short answer is that simply logging in to your PC isn't enough after a password change. You probably have to log in to a couple of additional places: OneDrive, Mail, and perhaps other apps as well. One account to rule them all? Given Microsoft's near insistence that we use Microsoft accounts to log in to our Windows 10 PCs, it doesn't seem like much of a stretch that they would use the same account for everything else account-related on your PC. They do and they don't. Apparently, successfully logging in to your PC with your Microsoft account isn't enough to log in to other applications that also use your Microsoft account. Not long ago, I changed my Microsoft account password. It went relatively smoothly, but I had to re-log-in to all my PCs if I wanted the Microsoft account connection to remain active for things like Windows Updates. That much makes sense. Then I started getting this “there's a problem with your Microsoft account” message, just as you have, even though as far as I could tell, there was no problem at all. The “trick”, in my case, was to remember that there were two other applications I had used — perhaps only briefly — that also were associated with my Microsoft account. OneDrive – I rely heavily on OneDrive, and sure enough, it had stopped syncing. I needed to open OneDrive properties and re-authenticate my Microsoft account there. Mail – I don't use the Mail app in Windows 10, but I do have it configured so I can answer questions and test things out. It's configured to connect with my Hotmail account, which is my Microsoft account. I needed to open account properties and re-authenticate my Microsoft account here as well. Once I took those two steps (on each of my Windows 10 machines), I stopped getting nagged. My login account — a Microsoft account — would automatically be used for Microsoft-related services on the PC. If there was a problem with an app's ability to use the account, the error would at least tell me which app or apps were involved. Someday, perhaps one or both of those expectations will be met, but right now they're not. The bottom line: if you get a warning about your Microsoft account, be sure to check out any apps that use the same account your PC does. It's likely the issue is there. Related Links & Comments: Why is Windows 10 Telling Me "There Is a Problem with Your Microsoft Account"? I'm trying to delete a document in the queue of my printer, but I can't. It writes “deleting”, but it never finishes. I've tried to cancel the same document from the field of my printer but it doesn't disappear. Restarting my computer, restarting the document, turning off the printer, unplugging the cables, still I can't. What else can I do? It doesn't allow other documents to print! This happens too often, and you'd think Windows would have figured out how to handle it by now. When you print a document, it's not sent directly to your printer. Instead, it gets placed in a queue. Once in the queue, Windows comes along and notices something needs to be printed, and sends it to the printer. The problem is that sometimes the queue gets “stuck”, for lack of a better word. It can be really, really frustrating. It's also easy to fix. Continue Reading: How Do I Remove a Document Stuck in My Printer's Queue? How Long Does Email Delivery Take? 1. How long does e-mail delivery typically take? What are the most common ranges? 3. Where the addressee data seems valid, how long will the mailer-daemon at my e-mail host (or whoever) keep trying? Answers to these questions might be of general interest to people frequently replying to pen pals. I'm guessing it's really only the answer to #1 that most people will be interested in, but I'll hit the other two as well. People have high expectations of email, and most of the time, those expectations are met. However, what's considered “allowed behavior” may surprise you. Continue Reading: How Long Does Email Delivery Take? « Previous post: Ask Leo! #693 – How Do I Get the Windows 10 Creators Update 1709 to Install?